April is a cake month around here. Miss M has her birthday in early April, and Genius Pants has his at the end. Of course, with each Birthday, there must be a small family celebration on the actual day, followed by a birthday party on the next available weekend. Adding to that, Miss M also requires that a slew of cupcakes accompany her to school on her actual day. That makes five cakes. At LEAST. Yesterday afternoon, I made the fifth cake of the month - a very simple cake for a simple gathering of our closest friends, just as the boy, himself requested. 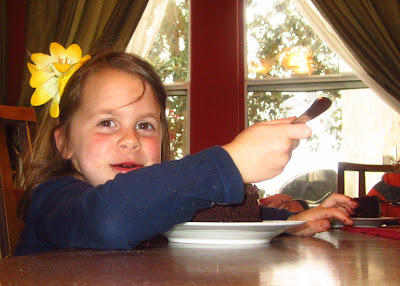 It's my absolute favorite chocolate cake, and is a one bowl, one spoon affair. Crazy simple. The original recipe is specifically for a single layer, to be dusted with confectioner's sugar (which I often make for a quick after-dinner-need-some-chocolate sort of thing). This cake is also VEGAN. No kidding. you would never in a million years know from the dense, chocolate-y goodness. Next time you need a chocolate fix, I PROMISE this will do 'ya. Or, you can do as I did last week, and double the recipe and make this Minecraft Cake for your ten year old's small, family gathering. TEN????? HOW IS HE TEN, ALREADY??? DOUBLE-DIGITS = AARRRRGGGHHHH! He ever-so-adorably showed me what the "Cake" in Minecraft looks like (who knew?!?! ), but honestly, it would have required fondant to best emulate the pixelated squares. I'm not a huge fan of fondant, so I decided to make him a Minecraft Dirt Block Cake instead. In the end, I had to make a quick run to the dollar store for something.... Imagine my surprise when the very first thing I see as I walk in was a 12" x 12' square of green, plastic turf. Well, Well, Well. That oughta do it. SO-- I made the Minecraft Cake with the Vegan Chocolate Cake recipe, Hershey's Perfectly Chocolate, Chocolate Frosting*, crushed Chocolate Creme-Filled Cookies for the "Dirt", crushed and green food-colored Vanilla Wafers for the grass and.... a piece of that Green Plastic Turf square from the dollar store. NOTE: I DID separate the plastic turf and the cake with a piece of wax paper, and I washed the plastic with dish soap and water beforehand. It's entirely possible we will all die of some sort of horrific plastic poisoning, but it was totally worth it. Underneath the plastic grass, it STILL looked like a Dirt Block. And those crushed cookies were totally edible, if slightly gritty. C'MON! It's a DIRT BLOCK CAKE! Just bringing the realism! And at the end of the day, my sink looked like this. THIS is Andy--- The Culprit behind THE GREAT MAGAZINE MASSACRE. I just thought I'd include a picture of my mangy, gangly, 6 month-old shelter mutt for your viewing pleasure. Nah. I'm just kidding. He's totally not. *see the bottom of the linked recipe... or look at the back of your Hershey's Cocoa container. It's always there. AND, it really is the best and the easiest, I think. I don't even melt the butter. I usually just beat it all together in my butterfly-bedecked Kitchen Mixer. Totally works. Hi there! 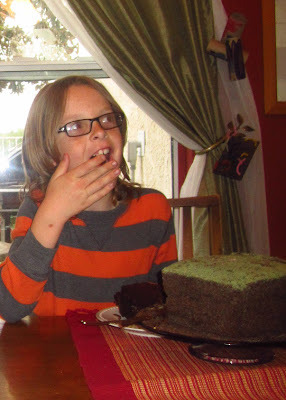 I love your minecraft cake! April is cake month here too, but my boys' birthdays are a DAY apart! OY! The link to your chocolate cake recipe didn't work for me, I wondered if you there is a different link available? Thanks so much for your creative idea! I'm CROSSING my fingers that the dollar store here has grass ANYTHING I can use for my 8 year old's minecraft party! I'll fix the embedded link, too. HA! Yeah, we aren't vegan, or even vegetarian. It was just a vegan cake recipe that happens to be delicious. Also, we pick our battles wisely. Hair is not a battle I worry about. He has since had several haircuts, all of them ending in tears. He's a good kid. I give not one damn how long his hair is, especially here, in Southern California, where most of his classmates sport the same style. There are, however plenty of vegetarian and vegan followers of this blog, to whom I would like to apologize for your freakishly insensitive statement. Sorry guys. Hi there! I can't get the recipe for your choc cake. Do have the ingredients you could post?